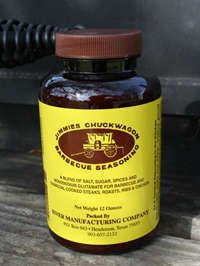 Jimmie's Chuckwagon seasonings and dry rubs are always guaranteed to be fresh and flavorful. Our fine products are found in retail stores or can be ordered directly from River Manufacturing. Whether you're cooking pinto beans or just want to pre-season meats headed for the smoker, we've got you covered. This is the old original. It is one of, if not the oldest, continuously marketed dry rub/seasoning in the south. This rub began in the early fifties and has had a steady following ever since. Not quite as much kick as our Rotisserie Blend, so a really great seasoning for most women, children, and the ever present Tendermouth. A great all-around blend for the grill, the smoker, or for mom in the kitchen. Try some soon. You won't regret it. Comes in 10 oz. jars. 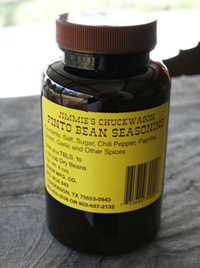 Our pinto bean seasoning is a wonderful blend of flavors that suit a pot of pintos to a tee. Whether you use it by itself or with one of our other products, you just can't beat it. If you love a good pot of pintos and cornbread, you must have some of this. Comes in 8 oz. jar. Bulk (must order 5 lbs or more) - $10.00 per lb. 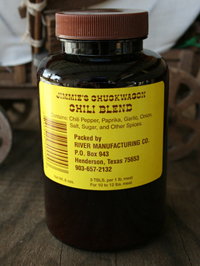 Our chili seasoning is a blend of all natural spices that will make the best pot of chili you've ever eaten. Comes in 6 oz. jar. Our Rotisserie Blend is by far our No.1 seller. It has won scores of cook-offs all across the south in all categories. 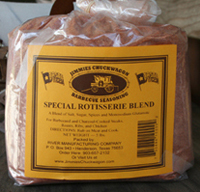 (Brisket, ribs, pork roasts and chicken) It is truly a unique seasoning due to the proven fact that it's good on everything. (Well, maybe not ice cream). If you want a little more kick, it's also available in a "Hot" version, which is a great way to liven up some hot wings or ribs. It makes a great pot of pinto beans and makes about the best hamburger you will ever eat. Packaged in 5 lb. bags, it's for the serious cooker that enjoys cooking and will spend a lot of time around the fire-box. A 5 lb. bag will cover from 100 to 150 lbs. of meat depending on personal preference. This comes to about .17 cents per lb.of meat seasoned if you purchase the $22 bag. Wholesale rate would be about .12 cents per lb. of meat seasoned. Note that these figures do not include shipping charges. 4-7 bags for $20 each. 4-7 bags for $22 each. Copyright 2019 - River Manufacturing Co.